How can we access our data stored in processes and forms and analyse it? How can we build our reports based on this data? 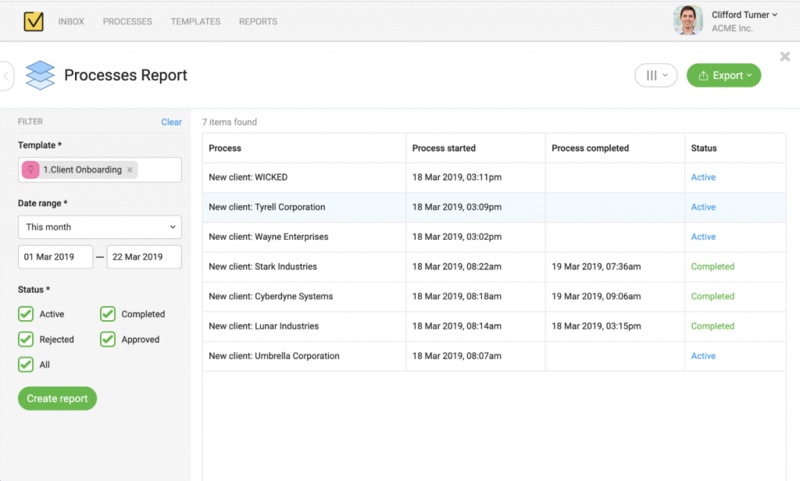 In Metatask you can now use three built-in reports to get full access to all your tasks, processes and all the forms data stored inside processes. You can click on the Reports top menu to access reports page, where you will see a list of all available reports. To use any report you will need to fill in report filter parameters first. After you click on “Create report” you will see a report data preview in a table. Some reports may have a large number of columns and you may want to hide some of columns or freeze some columns to always see them while scrolling through your report. 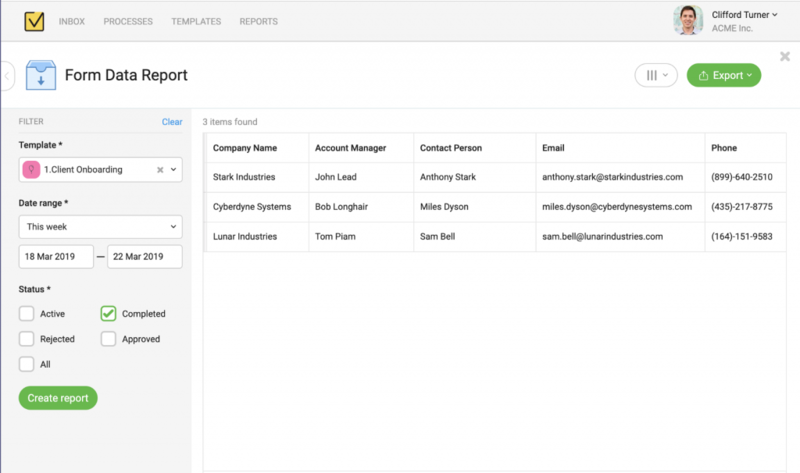 You can find a more detailed guide on using all reports features in our Help Guide. How to export report data to Excel or CSV? While on-screen preview is a great way to take a quick look on your data, like check all invoices for last month or review new hires in current year — for real data analysis nothing can beat old good Spreadsheets. You can export your data from any Metatask report in two different file formats — Microsoft Excel and Comma Separated Values, commonly known as CSV. Click on Export button and select either Excel or CSV and after that report will be generated and downloaded to your computer. For most reports data exported to any of two formats will be the same, except for the Forms Data report. This report includes data from table sections nested inside a process form and Excel report will place each table section to a separate tab inside Excel workbook. 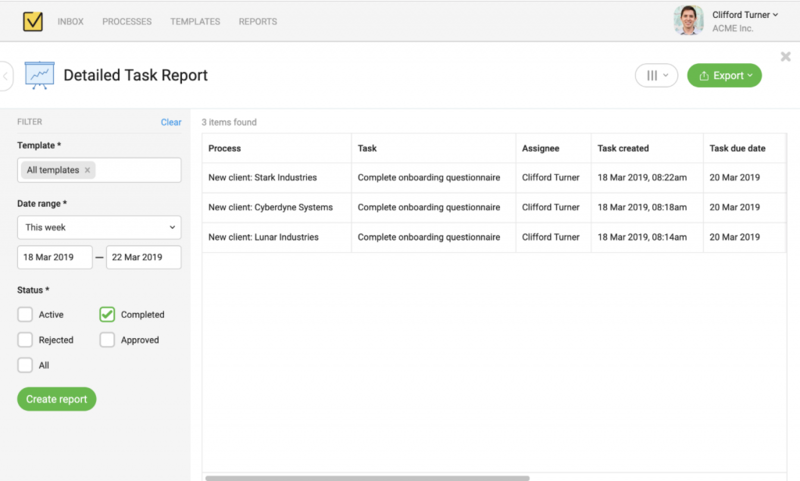 Processes report allows you to review a list of your processes for a single specified template. Filter also includes a data range and a current status of report. 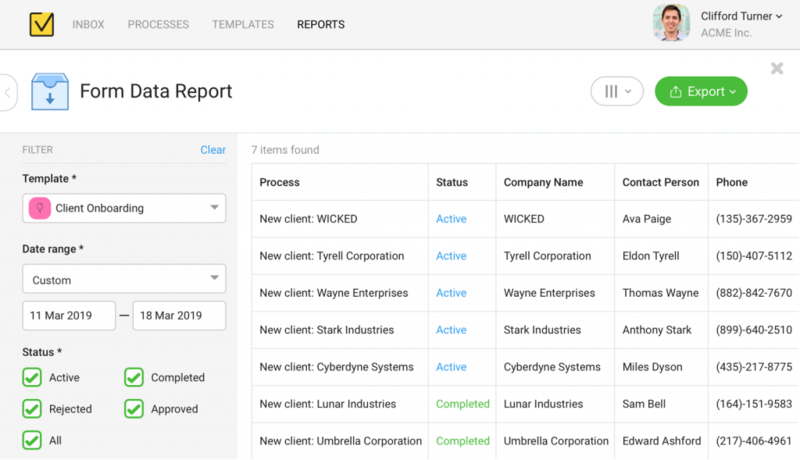 This report let you select multiple templates and find all related processes and its a great tool when you want to get a quick stats and a current status for a group of multiple related processes. You can find more information on Processes Report in our Help Guide. This report will show you a list of all processes for a single template with all related process data. This report is great when you need to review detailed status for processes of same type, e.g. list of all employees hired recently. 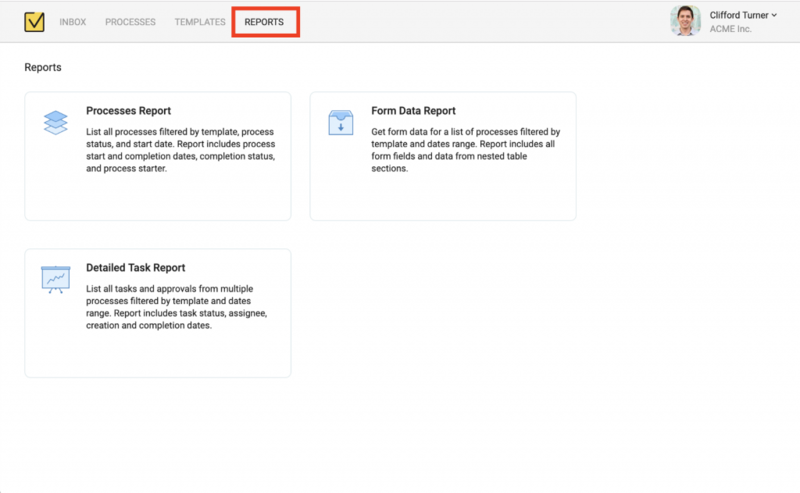 You can find more details on Form Data Report in our Help Guide. 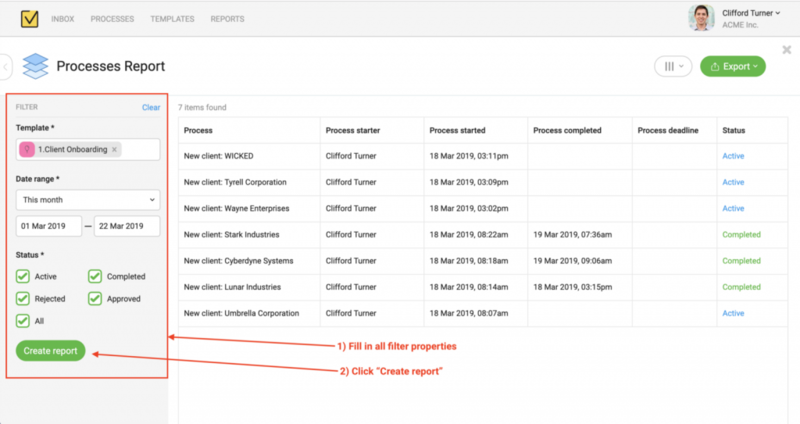 This report will show you a list of all tasks from all processes of multiple types. As usually you can filter by process status and select a dates range. Detailed Task report is great for quickly see what your team is working on or to do extensive analysis of a team performance. You can find more info about Detailed Task Report in our Help Guide. We hope reports would be a valuable addition and will help you better analyse your data and get some valuable insights into your business processes. Meanwhile our team is hard at work on our next release. This time we are going to add some polishand refineand improvemany places we wanted to improve for a long time but were just too busy with a larger features.